This is the perfect furniture for my kitchen. Great quality a lot space to put your pots and pans. The drop leave table adds a nice touch to it. This cart is large enough to hold all my pots in pans in one side and my small kitchen appliances in the other. I ordered a custom granite top from a local marble and granite distributor, but this wood top is nicer than I expected. If I Hadn't already ordered the granite, I would have kept the wood top. It took my husband about an hour to put it together by himself. We did not put the drop leaf on since we are using it flush with the wall. 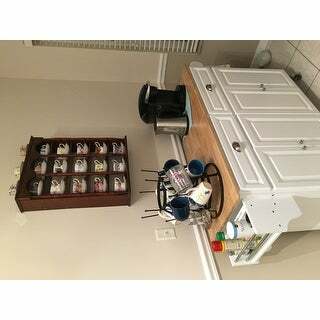 I use this as my "beverage center" withn our mugs, coffee pot and tea pot. Over all satisfied with the product. Seems to be of reasonable quality, looks good, and seems to be reasonably constructed. The instructions are not very good. The instructions are "picture only" and had to stop and think a few times to figure out what they where trying to convey. For instance there is nothing about how to adjust the cabinet hardware to make the doors fit right. Had to figure that out on my own. This is way past "some assembly required". This was almost all assembly required. Assembly took about 2 hours for a man with power tools and a helper. Power tools are not required but did help speed the assembly. The item arrived in 2 boxed which was great. It would be too heavy to carry in just one. It was packed reasonably well and the packaging seemed to have taken a bit of a beating buy ups but the item inside was in good condition. When it arrived the packaging had a big dent in it and there where foot prints on the out side of the box, but the item was well protected and arrived in good condition. There was one damage panel that was packed well in the center of the box. I do not see where this could have been shipping damage, but seem to have been boxed already damaged. This was an easy fix for the panels are reversible and just placed that one where the damage would not be seen. The Leaf is functional but doesn't appear too be to hardy. I instructed the family the leaf was just to hold bowls and utensils, but any "real" work should be done on the counter top over the drawers. The drawers do not have stops and can be pulled all the way out if you are not careful. The Wheels seem to be of good quality and sturdy. I think my biggest complaint is the manufacture did not include the "button" covers for the screw holes. This would have been such a simple addition that would have really dressed this cabinet up. With out them, you have all the screw holes visible. Its not a bad look, but the covers would have made it look so much better. I have tried to be detailed to help others with a purchase of this product. I always appreciate detailed reviews. Over all I think it is a reasonably good product. I hope this helps. 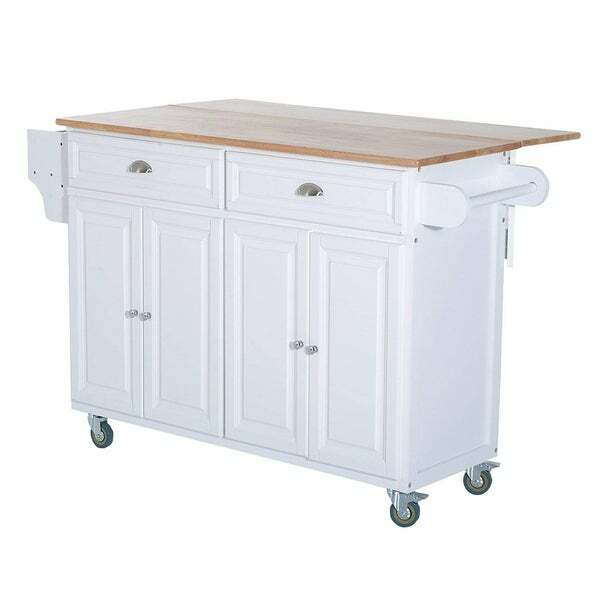 Nice kitchen island / cart. The paint quality is not amazing but it's good for the price. It's not a problem since it's kitchen furniture and no one will look at it from up close. This island is relatively easy to install - it took me (one person) about 2.5 hours. Overall good experience purchasing from Overstock and I'd buy this item again. This cart came in 2 boxes and took 3 hours to put it together. We get to the end of putting it together and notice a big gauge on the top of the island. The drawers were not even and the bottoms would not fit properly had to keep unscrewing it to line it up. Once put together it seems to be sturdy just really upset about the gauge in the counter top. But it was already all put together couldn’t send it back at this point. Hoping the company can just send a replacement top. Has decent storage and when open can seat 4-6 as a table top for a meal. Also it was missing the screws for the handles on the 2 drawers. Had to go but then at a store. Love the product. Tons of space in it. Not crazy about the odor it produces or the vague assembly instructions. Have left doors open to air out. and obviously figured out the instructions. Would absolutely recommend this product. This is exactly what I wanted. Pieces assembled easily and the island was square! It was worth every penny. It was stable and the extension was straight when lifted. I love it and highly recommend it. love the extra counter and storage space, definitely recommend. I put this whole cabinet together by myself and when I got to the doors none of them lined up so I have to hire somebody to come in and do that for me. Disappointed . Perfect addition to my wide kitchen! Directions were a little hard to follow but I was able to get it put together by myself in a few hours. "Can you install without the side rack ? If so, can the holes be covered with tabs?" You can choose not to install the towel or spice rack. There will be pre-drilled holes visible. These could be covered with tabs but tabs are not provided with this item, the customer will have to buy their own. "Does the 36”H include the wheels?" Yes, this does include wheels. "Does this island have a maximum load capacity for the inside shelves. I don't want to overload the shelves and have them come crashing down." The weight capacity of the inside shelves is approximately 30 pounds per shelf. It is the size I was looking for and fit my needs.